Access your campaign logs and see all the events that take place when your campaign starts running or use it to help troubleshoot issues. The Log tab on the campaign page contains technical information about the events that take place in the campaign. If there is any error in the campaign, the logs help you to understand the issue and solve it. When the campaign is switched to the Active state (manually). The campaign gets processed automatically (for example, it is switched using the API). Every N minutes when the campaign is in the Active state. Email account is linked to campaign. Email account was set up properly. All prospects are finished in campaign. All prospects are inactive in campaign (low priority). The selected schedule is valid. The follow up schedule is valid. Note: If steps 1-3 of check failed, the system does not proceed with the next steps. If any check failed, the campaign does not start and creates and error log. In other cases the system creates technical logs (see below). Text: Campaign: [Campaign name] Schedule: [Schedule name], [Timezone from schedule name], added to processing queue (manual launch). Wait approximately 30 min before checking results and stats.To get more info about how processing works read this [Article link] article. Text: Campaign: [Campaign name] Schedule: [Schedule name], [Timezone from schedule name], paused. Text: Campaign: [Campaign name] Schedule: [Schedule name], [Timezone from schedule name], added to processing queue (auto launch). Wait approximately 30 min before checking results and stats. To get more info about how processing works, read this [Article link] article. Text: Email account error occurred: [Text of error]. 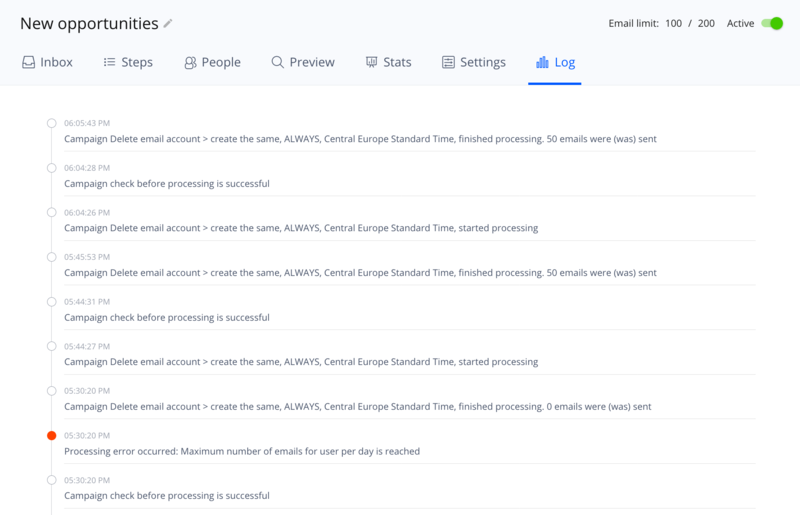 Text: Processing error occurred: Maximum number of emails for email account per day is reached. Text: Processing error occurred: Maximum number of emails for user per day is reached. Text: Maximum number of unique contacts per month is reached. Text: Processing error occurred: Sending rejected via SMTP server. Text: Processing error occurred: SMTP temporary problem. Text: Campaign [Campaign name], [Schedule name], [Timezone from schedule name], finished processing. N emails were (was) sent. Text: Error occurred: no email account connected to campaign. Text: Error occurred: no prospects added to campaign.